Fellows, did you forget that anniversary, birthday, or special occasion? 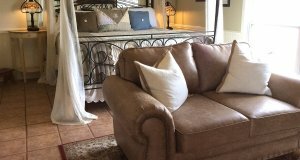 You can make up for it and get out of the "dog house" with a romantic stay at the Pear Tree Cottage. All will be forgiven when she sees the most romantic room at the Chuckwagon Inn B&B. 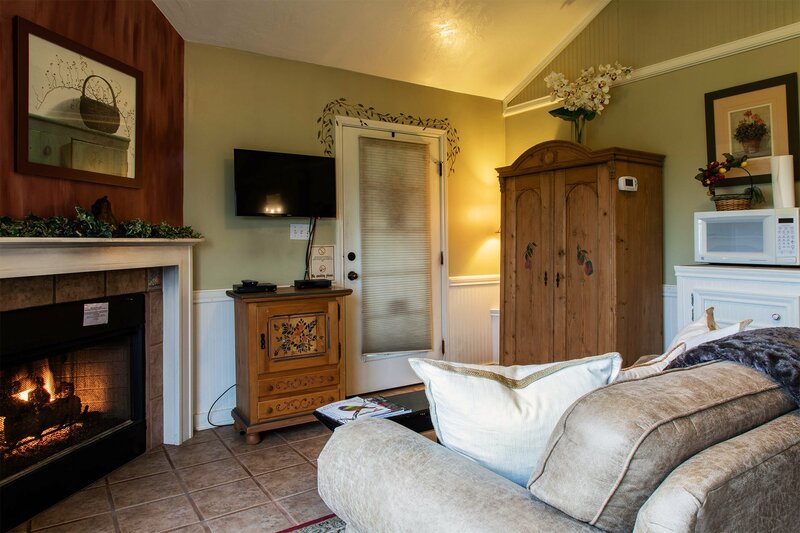 This beautifully decorated suite has everything for your enjoyment. From the gas log fireplace, TV/VCR, and the coffee bar with all the conveniences. The Mustang and Pear Tree were also part of the old dairy that has been beautifully restored without damaging the original structure. Sam and I wanted this historic old dairy (one of the first in Fredericksburg) to look exactly like it did at the turn of the century. This building even has the original sliding wooden door on the porch that was opened up after the milking to let the dairy cows back out into the pasture. The king-size four-poster bed is lovingly draped in sheer linen gauze and the down comforter it covers is a top of the line ultra plush pillow top mattress. This pillow top mattress is so comfortable that it will make you want to sleep a little longer, but just make sure you don't miss our fantastic breakfast. There's no partridge perched in this pear tree, just a romantic two-person whirlpool tub and shower to slide into and soak your cares away. The Pear Tree Cottage at the Chuckwagon Inn Bed and Breakfast is such a joy that many of our guests have scheduled return visits for the next anniversary, birthday, or special occasion. 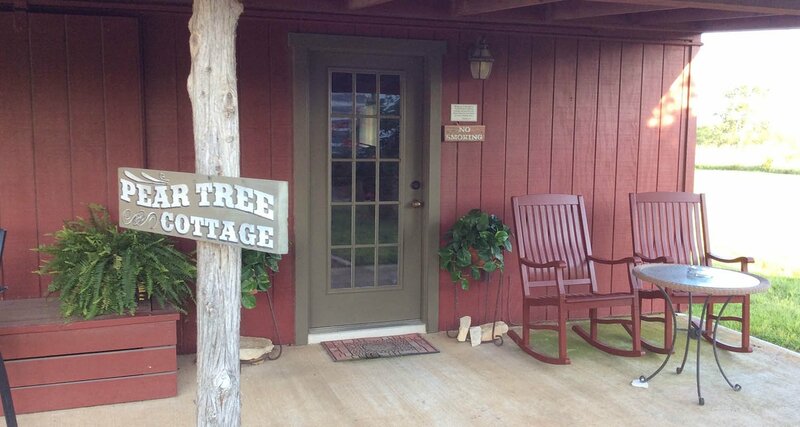 Come see why this cottage is such a special place. 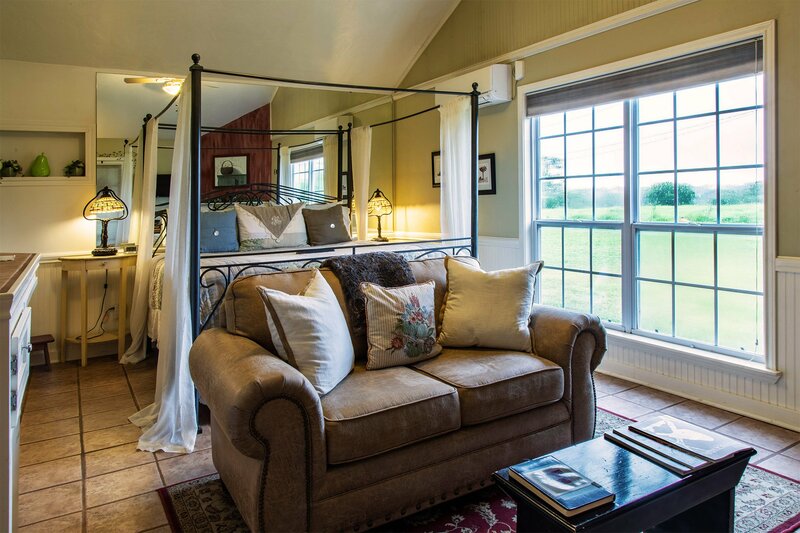 Four poster bed with sheer drapes, king ultra plush pillow top mattress and custom made bedding. Coffee bar with microwave, fridge, coffee pot and dishes. 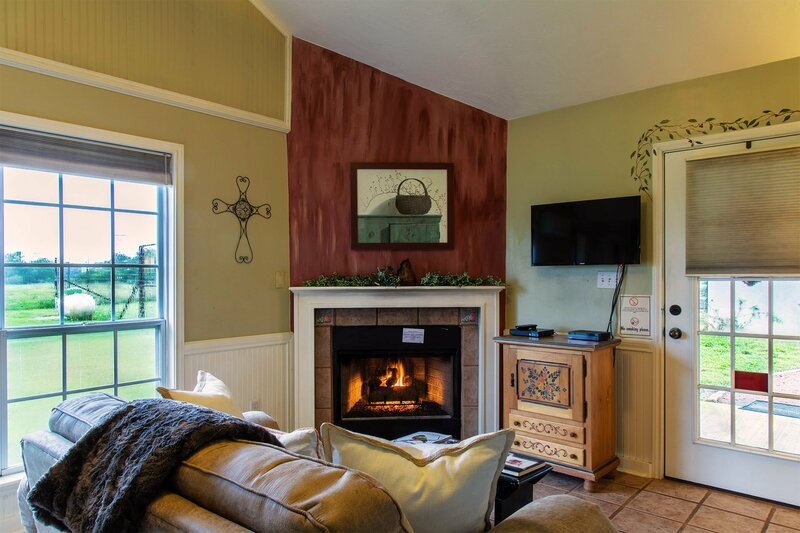 Sitting area with comfortable sofa and corner gas log fireplace. Flat screen TV, Blu-ray player, and Wi-Fi. 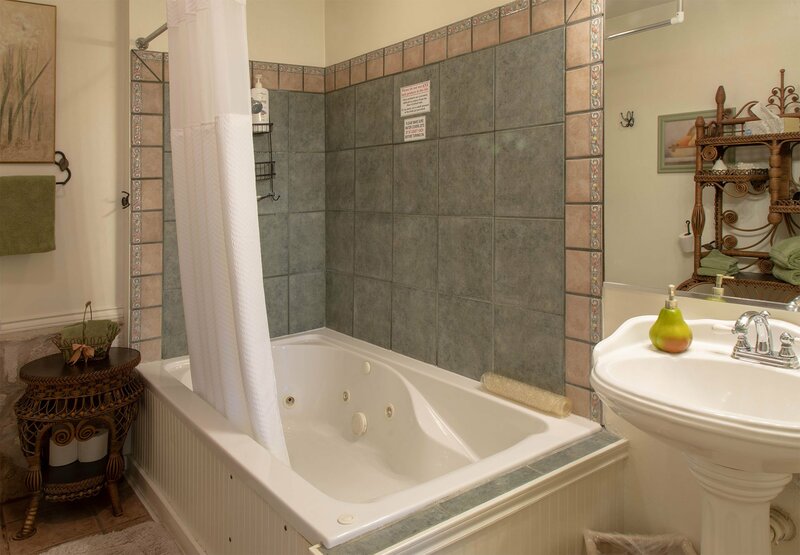 Pear themed tiled bath with double whirlpool tub and shower. 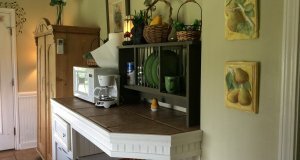 Side porch with dining area overlooking beautiful landscaped property. The following amenities are not available: audio and visual emergency warning devices, amenities within accessible range to reach, closed caption decoders, controls operable without grasping or twisting, door lever hardware, roll-in showers, text telephone (TTY/TDD/TT), grab bars alongside toilet, grab bars by the tub, transfer seats to tub, wider guest room and bathroom doorways, short stature accessibility kits, wheelchair-accessible lobby, wheelchair-accessible public entrance, wheelchair-accessible public restrooms, wheelchair available on request.